Located in Norwalk, The Maritime Aquarium at Norwalk offers immersive and educational experiences to visitors of all ages. This institution focuses on displaying marine life found in and around Long Island Sound. Visitors have the opportunity to learn about, and in many cases interact with, species that have long been considered mysterious. Harbor seals, meerkats, and black dragons are just some of the many species on display in the museum’s eight galleries, which all represent different ecological zones within and around Long Island Sound. At the center of the aquarium galleries, Newman’s Own Hall is home to the harbor seals residing at The Maritime Aquarium at Norwalk. This unique indoor/outdoor exhibit space provides the perfect backdrop for observing these expressive animals. Visitors can observe exciting seal training demonstrations and have an opportunity to engage with the animal husbandry expects on staff to learn more about the animals. The Marine Care and Culture lab is a great place to get a better understanding of how the aquarium ensures the safety of the animals in their care. Jellyfish and seahorse nurseries offer a rare glimpse of how these delicate sea creatures develop to maturity. For those who are curious about the unique body composition of jellyfish, The Maritime Aquarium at Norwalk’s new Jiggle a Jelly exhibit offers a fun opportunity to interact with and closer inspect the moon jellyfish. Having no heart, lungs, or brain, these seemingly alien orbs can seem intimidating at first glance. This feeling is often accompanied by a vague sense of trepidation as jellyfish are often associated with painful stings from their nematocysts. However, this particular species has a very mild sting that most visitors are not likely to detect, making this exhibit a safe place to get better acquainted with these often misunderstood creatures. Dragons have fascinated many cultures around the world since the dawn of time. Their images as well as stories featuring dragons have become the stuff of myths and legends around the word. Visitors who are curious to find out how much of those stories is fact and how much is fiction are invited to get up close and personal with several different species of animals that share the word “dragon” in their names. The weedy sea dragon, dragon moray eels, sailfin dragons, bearded dragons, and frilled dragons are just a few of the species on display here. The highlight of the exhibit is the rarely seen black dragon, which is the only one of its kind housed in an aquarium in the country. By far one of the most amusing exhibits at The Maritime Aquarium at Norwalk, the playful meerkats can often be seen frolicking with their friends around a transparent enclosure that is perfect for visitors’ viewing pleasure. The animals housed at The Maritime Aquarium at Norwalk are actually six siblings who originated from Hogle Zoo in Salt Lake City, Utah. In the wild these creatures are native to the Kalahari Desert in Botswana and South Africa. Being extremely social, they form groups that are often referred to as mobs or gangs due to their cooperative survival mechanisms. While sharks are often considered to be the most feared predators of the ocean, visitors may forget this fact as they observe trained divers swim right alongside these often docile creatures. The Ocean Beyond the Sound exhibit showcases marine life found outside the Long Island Sound. 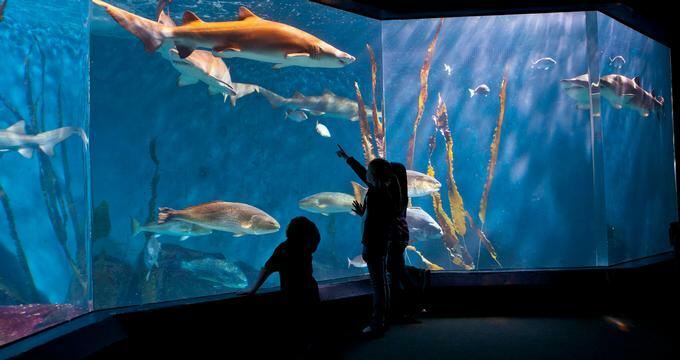 For this purpose, the Maritime Aquarium at Norwalk constructed a 110,000-gallon tank to contain an ideal habitat for their collection of larger fish, which include the sand tiger shark and lemon shark, who live alongside sea bass, red drums, and black drums. Depending on the day, visitors can also observe live feedings in this exhibit. However, due to their low metabolisms, sharks only need to be fed three times a week so it is advisable to check The Maritime Aquarium at Norwalk’s website in advance of planning a visit to catch this attraction.